To celebrate my birthday this year, D took me out to afternoon tea at the Westin Moana Surfrider. 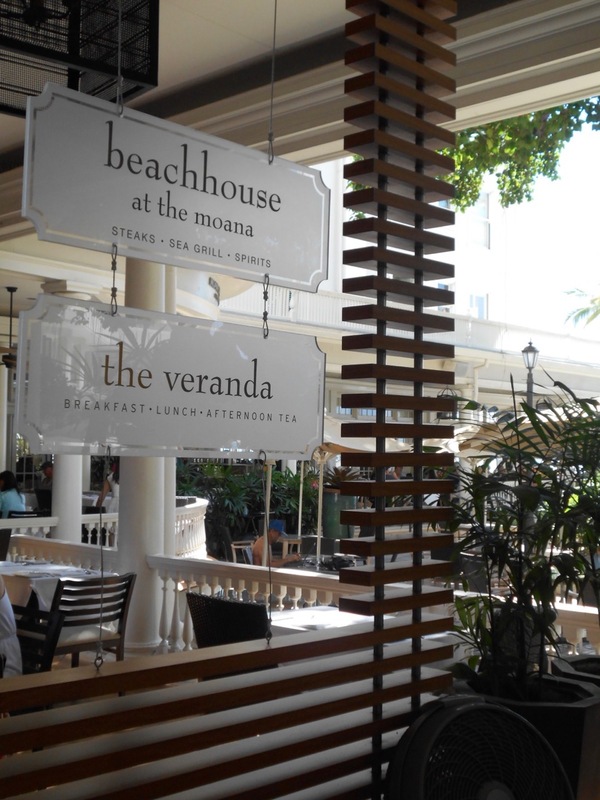 I love the tea at Halekulani’s Veranda and the Kahala Hotel’s Veranda and I had always wanted to try the Moana Surfrider. The Veranda is an open-air restaurant located just off the center lobby, overlooking the courtyard shaded by this historic banyan tree. In the beginning our server came by with each of the six loose teas to smell which was a lovely touch. D chose the Moana Sunset and I chose the caffeine-free Lemon Rooibos and of course, milk for Nomz. We ordered a Keiki Afternoon Tea menu ($22.00) for Nomz which consisted of PB&J and tea sandwich, assorted desserts and potato chips with milk or juice. I LOVED that they offer a kids menu because 1) it made us feel welcome as a toddler-toting family, and 2) this mama didnt want to share! and 3) we didn’t have to order the full menu which Nomz probably couldn’t finish anyway. I ordered the basic Veranda Tea ($34.00) option which consists of three finger sandwiches, scones, assorted desserts, choice of tea and a sorbet at the end. Today’s sandwiches were: pesto chicken with goat cheese and roasted tomato, smoked salmon wrap, and curried egg salad tart. Top tier: Haupia roll cake, hazelnut eclair, and macadamia nut shortbread. 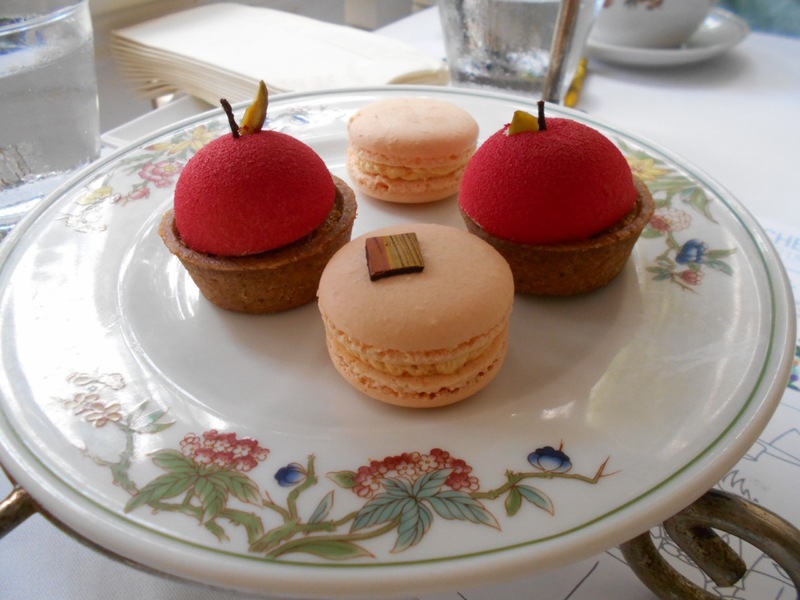 Bottom tier: Pumpkin macarons, mini apple tarts. For comparison D ordered the Moana Classic Tea ($40.00) which included everything I had plus an additional savory item (the seafood profiterole below) and a pot de creme with biscotti. 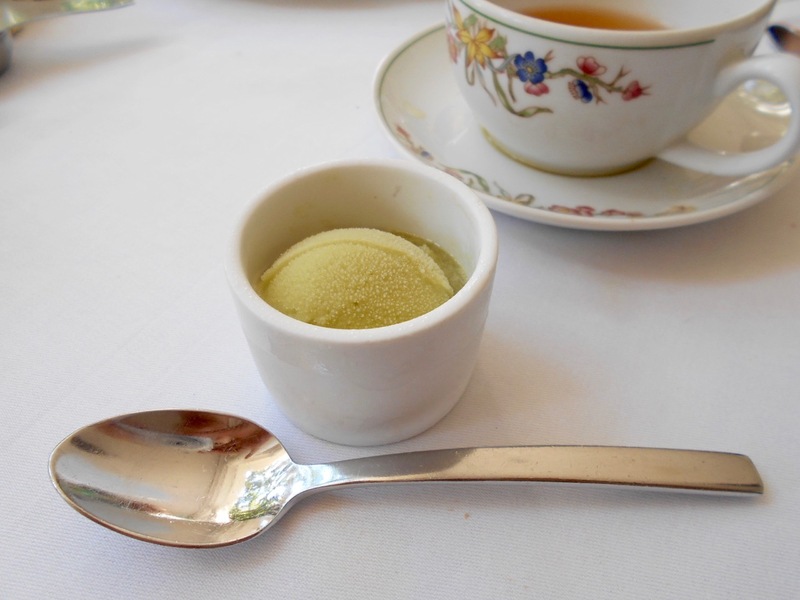 And we all were served a lemongrass sorbet at the end. In conclusion, the food was comparable to the Kahala and Halekulani but the ambience was a bit lacking (the whole restaurant and courtyard/beach bar area was noisy and bustling, and the patio directly in view was a bit worn and in disarray) and the service less polished. I think my favorite is Halekulani. 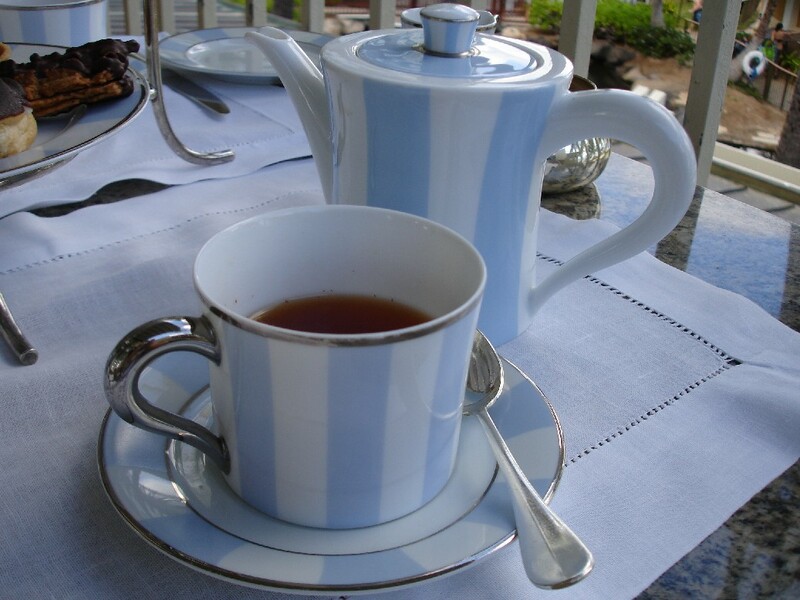 When the Four Seasons opens in Ko Olina next year, my wish is that they offer afternoon tea so we can enjoy an elegant tea service close to home. I love everything about afternoon tea. I love scones, I love tea, I love sweet & savory items together. I love getting dressed up and chatting the afternoon away like I don’t have a care in the world. I feel blessed that I got to spend this afternoon with my two favorite people in the whole wide world. This month’s get together with the girls was at our friend’s new place in Pearl City. Of course the main objective was to see her baby girl who is now almost 5 months old and absolutely adorable! Since I worked half day in the morning, she suggested an afternoon tea instead of lunch. 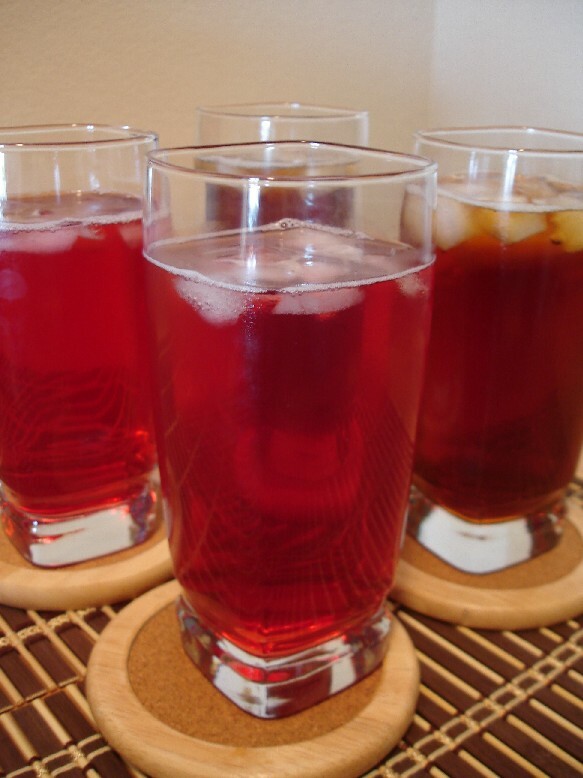 She brewed iced Tazo passion tea for me (caffeine free) and Tazo awake black tea. 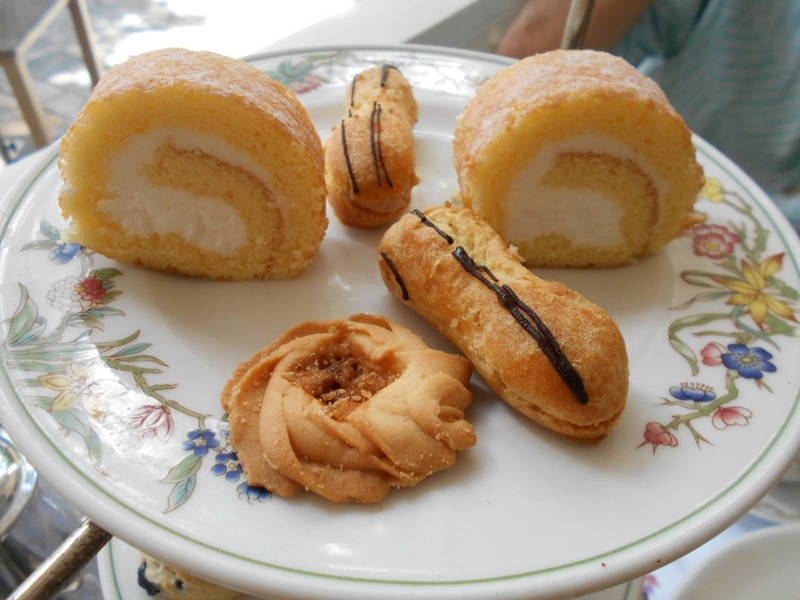 We enjoyed these mini “sandwich puffs” from Beard Papa which are sandwiches, but they’re stuffed in cream puff shells! There was chicken salad, tuna, and seafood salad. Everything was so delicious and I was quite full afterwards. 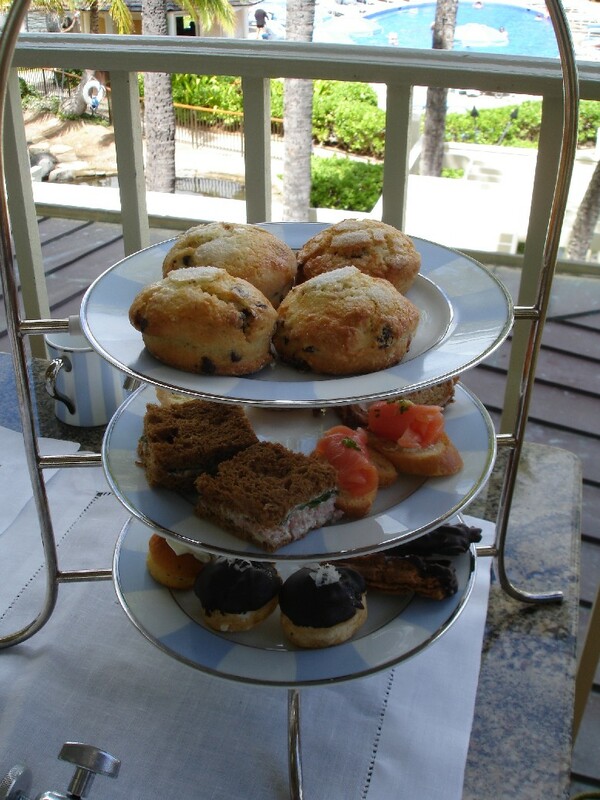 I’ve always wanted to try afternoon tea at the Kahala Hotel and Resort. I’ve dined at this gorgeous hotel many times, but never had afternoon tea. Luckily I had a gift card so together with my sister-in-law #4 we headed off to enjoy tea, pinkies up, on assignment for my blog. What is it about afternoon tea that I love so mucｈ? I think it’s that it combines everything I love: a pot of freshly brewed tea, a collection of teeny wheeny morsels of food, a relaxing time, girl talk, all in a beautiful elegant setting such as a five star hotel. It’s not just tea, it’s an experience, an escape from my hectic life which is not always as elegant and relaxing. 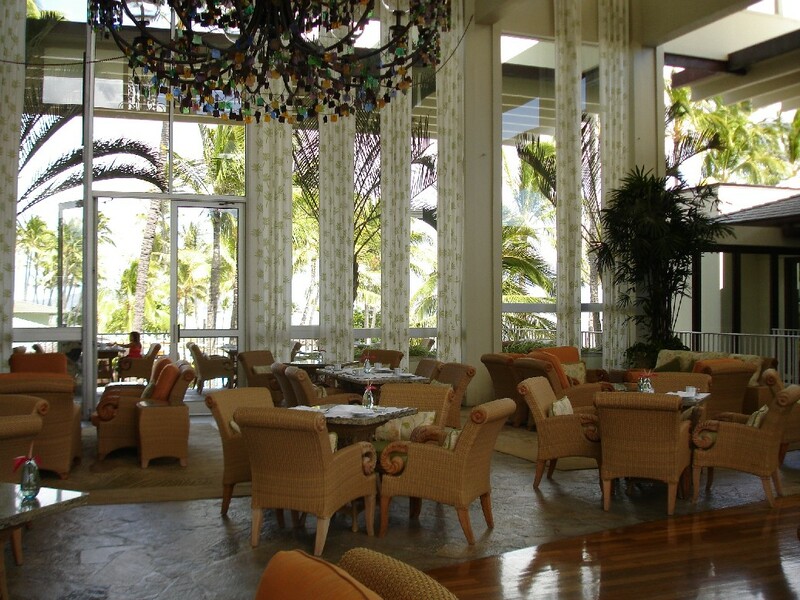 Tea is served daily from 2:00pm to 5:30pm in the Veranda which is an open air lounge just off the lobby at the Kahala Hotel & Resort, with sky-high ceilings and soothing sage colored decor. There’s seating both indoors and outdoors, and they have couches as well as tables (I prefer tables since I like my food to be at chest level, not knee level). We were led outdoors to our table on the balcony that overlooks the hotel pool and dolphin lagoon. It’s a little breezy out there, but the view makes up for it. I decided on the Classical Tea Service ($28.00), their standard tea service with assorted tea sandwiches, scones with clotted cream and jam, and pastries. Sister-in-law opted for the Royal Service ($42.00) which includes all of the above plus a glass of champagne. 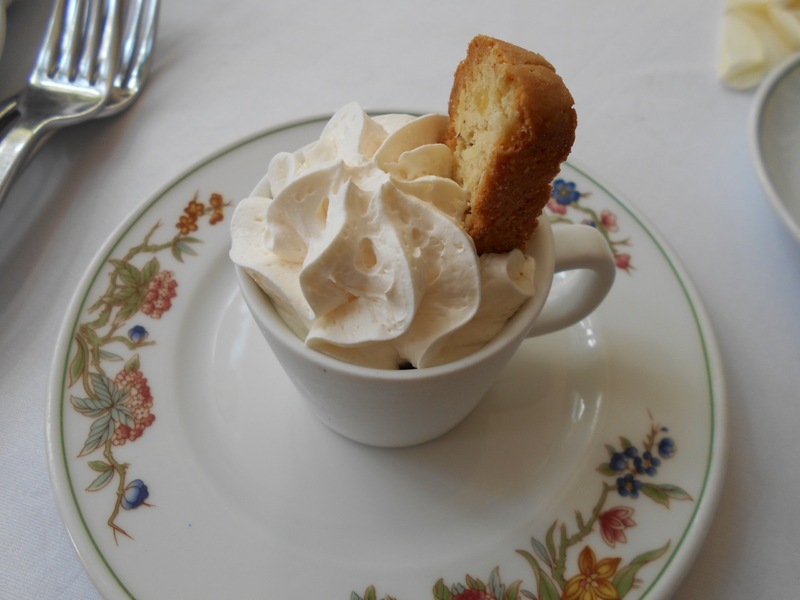 Our server described some recommendations from the Mariage Freres collection, from which I selected Marco Polo, a caffeine-free Rooibos tea with fruity notes, and sister-in-law had the Eros which had floral rose petal flavors. 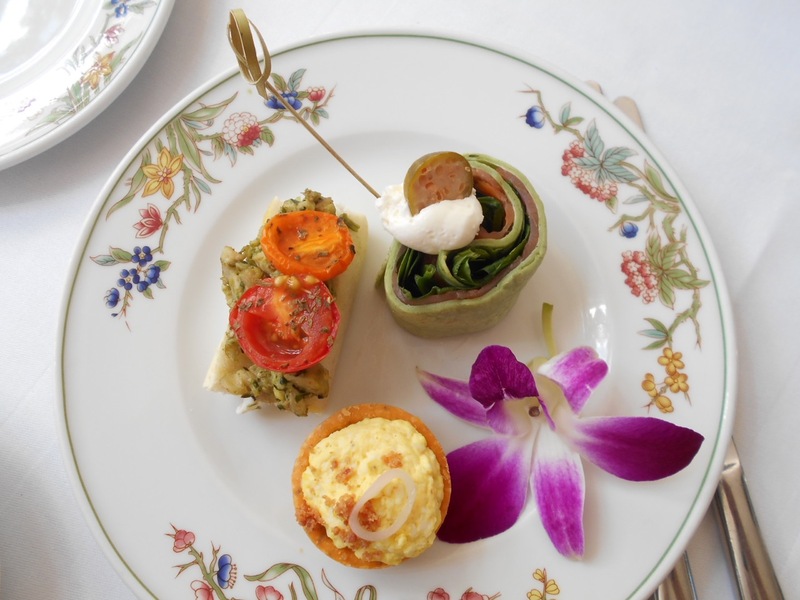 Everything is served on the prettiest powder blue colored Bernaudaud chinaware (if I remember correctly, Halekulani also uses the same high-end brand for their tea service), but unlike Halekulani, the food is presented on a 3 tiered stand all at once. 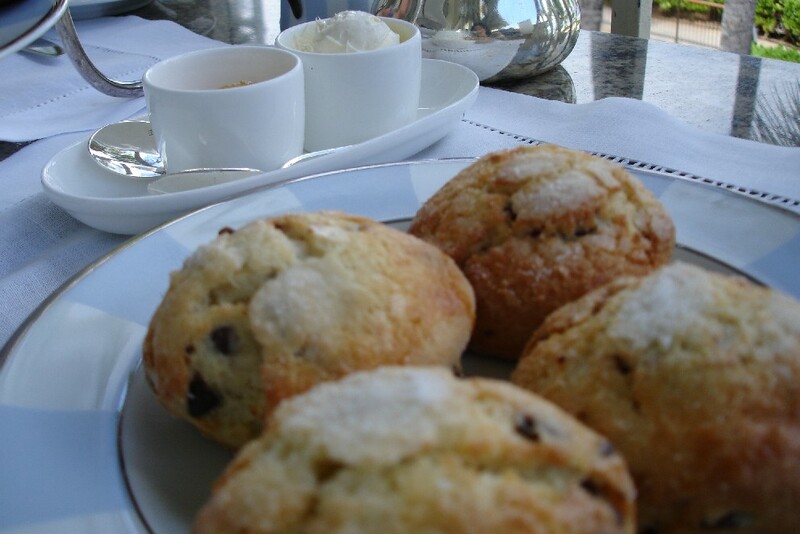 At the top are chocolate chip scones and cranberry scones – yum! On the next tier are the day’s selection of finger sandwiches: smoked salmon with a touch of fresh ginger, deviled ham with herb butter, “Maui surfing”(that’s what our server said it’s called; a cinnamon flavored bread with goat cheese and pecans), and Maui onion quiche. The bottom tier holds the sweets: Chocolate dipped hazelnut biscuit, haupia cream puff, lilikoi tart, and lemon poppyseed cupcake. Everything was delicious. Sister-in-law who is not that into sweets, said she wanted more of the savory items than the sweets, or at least the choice to substitute some items. As for me, I love my sweets. 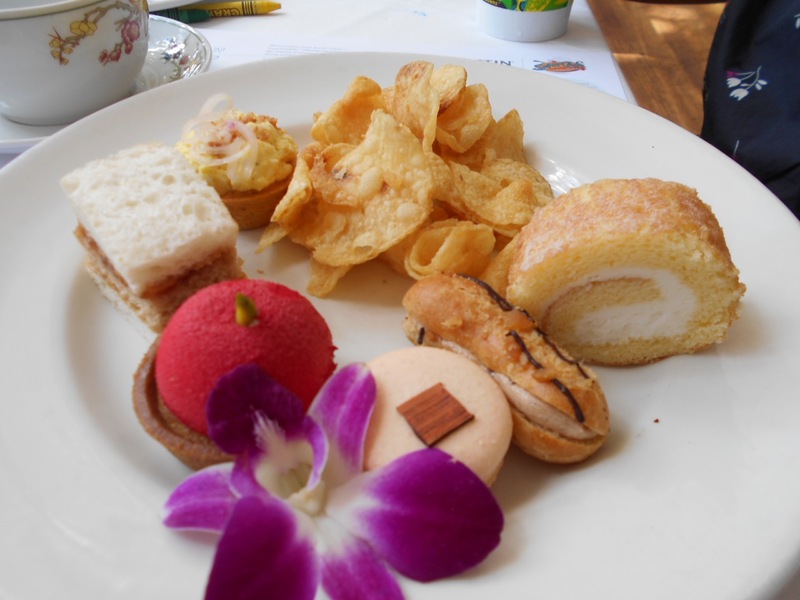 If you’re wondering how the tea compared to Halekulani, I’d say they’re very similar in terms of price, quality of food, presentation, and service (check out my review of afternoon tea at Halekulani here). 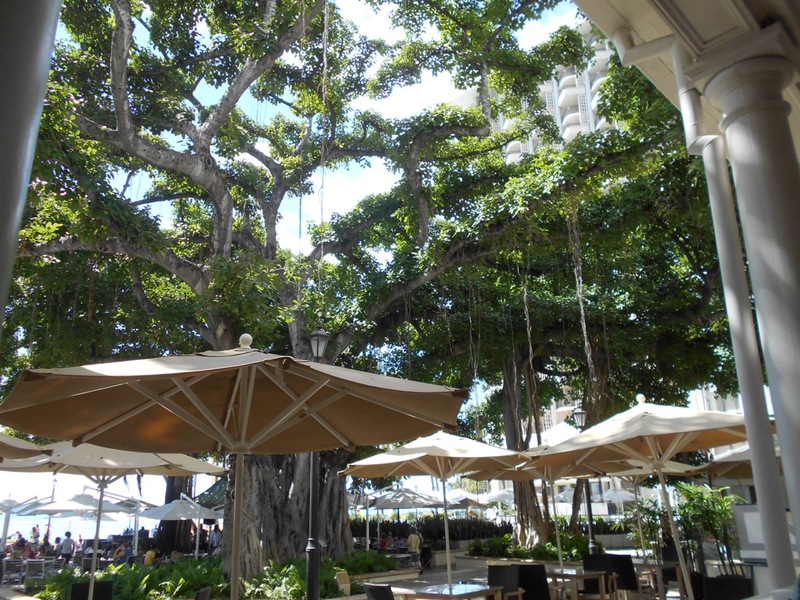 Next on my list: tea at the Westin Moana Surfrider. 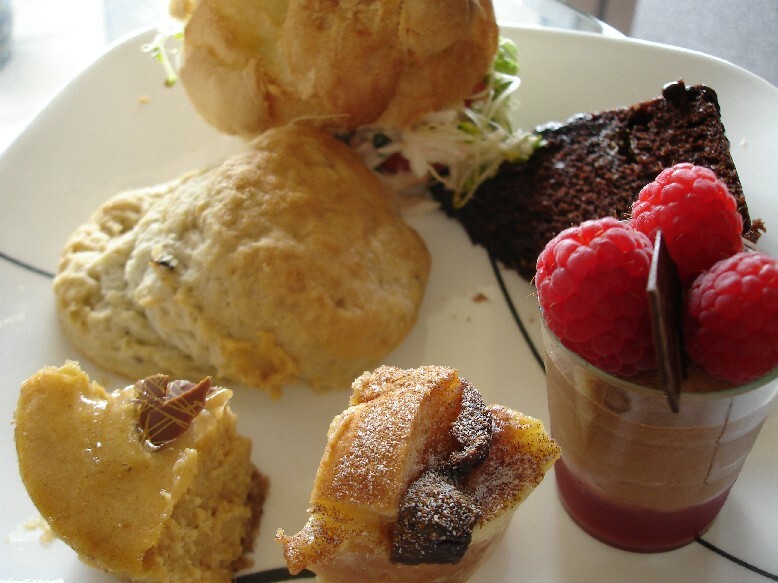 Click here to view the afternoon tea menu on their website. 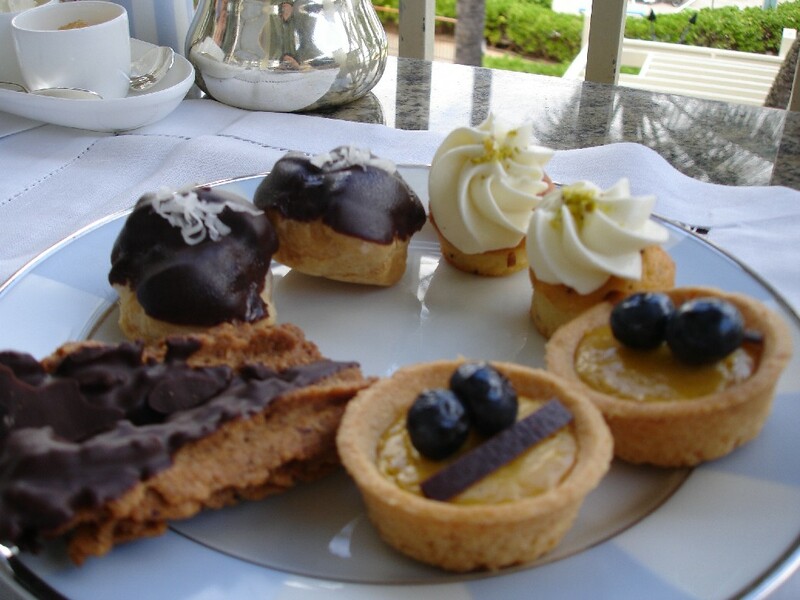 Instead of going to lunch today, my coworkers and I decided to treat ourselves to Afternoon Tea at Halekulani. Just for fun. One of the best things about working in Waikiki is the variety of dining options within walking distance. I LOVE afternoon tea, but it can be a little tricky. Do I have a big breakfast and skip lunch? Or do I have a light lunch? Will I be hungry again for dinner? (As mentioned previously, in my family our lives revolve around our meals. We’re a little overly concerned about when and what our next meal will be). I finally decided on a hearty breakfast and also brought a snack with me to munch on during the work day. Afternoon tea was fabulous. It’s served daily from 3:00-5:30pm in a little area called the Veranda at Halekulani, where you can relax in plush armchairs overlooking the grassy courtyard. 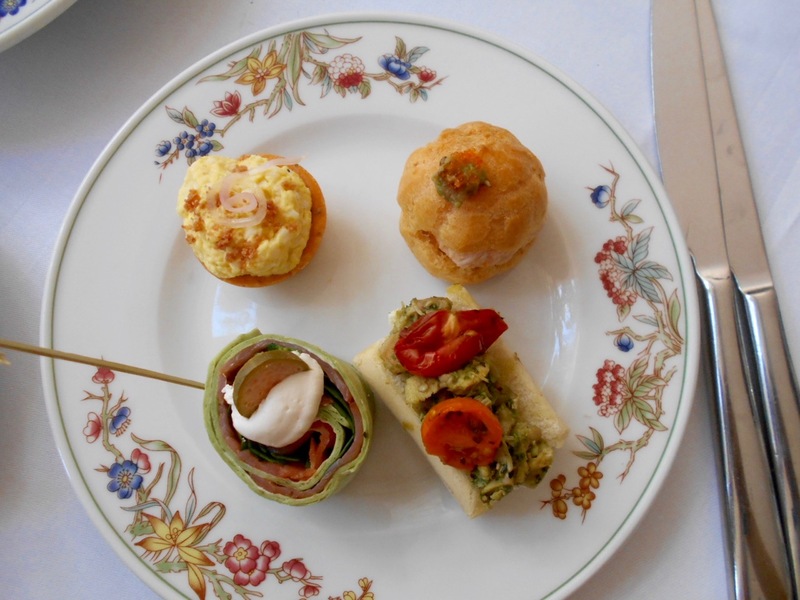 Tea is $26.00 per person and includes “a properly brewed pot of tea”, assorted tea sandwiches, scones, and pastries. I went with a caffeine-free Pineapple Coconut Rooibos with Mango tea, my coworker had Earl Grey, and my other coworker had Orange Pekoe, served with lemon, honey, and cream. First course is the assorted tea sandwiches. They’re so tiny and delicate (translation: if my husband had a plate of these put in front of him, his reaction would be outrage). Clockwise from top: Chicken and Apricot on Raisin Bread, Roasted Eggplant, Zucchini and Olive Tapenade on Focaccia, Lobster and Crab on Baguette, and Smoked Salmon on Pumpernickel. Next were the Blackberry Scones with Devonshire Cream, Lemon Curd and Raspberry Preserves. Three words: TO DIE FOR. Devonshire cream basically tastes like heavy cream in solid form – note to self: must add this to my grocery list – and Halekulani makes their own wonderful, creamy, tangy lemon curd. We all agreed we could eat a dozen of these scones, nothing else, and go home happy. But then the pastry cart was rolled out, from which you get to select three. I selected the Fresh Berry Tart, Mini Cream Puff, and Chocolate Cupcake as I thought to myself “if I begged, would they give me all five?”. But then I remembered I’ve been very bad these past few days with my sugar ban. 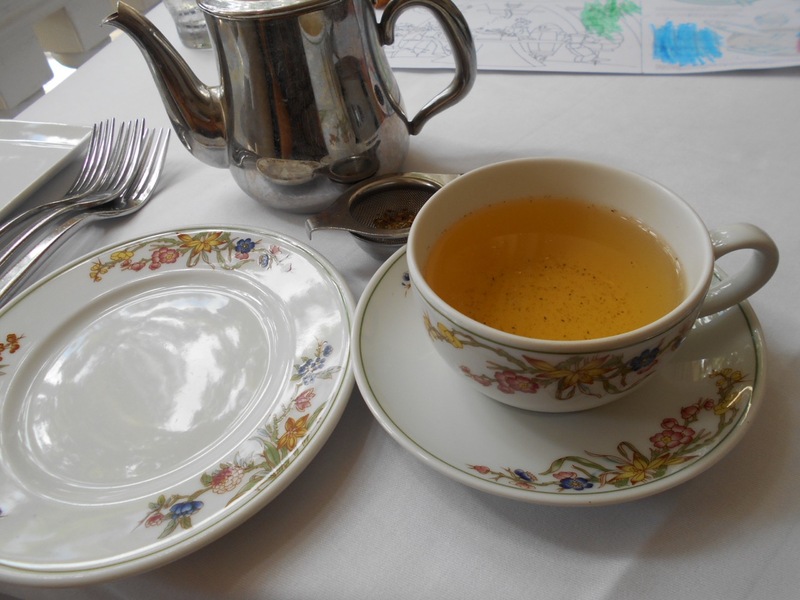 I so enjoyed tea today that I was inspired to go experience afternoon tea at some other renowned hotels next: The Veranda at the Kahala Hotel and Resort ($28.00) and the Veranda at the Westin Moana Surfrider ($32.50). Can you believe the coincidence that all three locations are called the Veranda! ?